A properly selected, correctly planted and well-maintained tree will provide a multitude of benefits for generations. An ill-chosen, incorrectly planted and/or neglected young tree, will die in only a few years, at best, and become a risk and a hazard at worst. Stand in the shade of a tree when the temperature is in the 90s. Then listen to the sounds of leaves rustling and birds chirping and insects buzzing. Have you noticed how the air under the branches of a tree seems cleaner to breathe? Look up at the blue sky through the green leaves or needles gently rustling against the sky. Plant a tree. It will bring great pleasure and health to you and others who pass by. What site factors influence optimum tree growth? Soil - Physical soil factors, especially the degree of compaction, are commonly overlooked when selecting trees but likely have the greatest impact on tree survival, growth, and health. If the soil is very compact, select trees that tolerate low soil oxygen levels and be sure to loosen the soil around the planting hole. Soil pH - degree of acidity or alkalinity - is also important as it affects the availability of nutrients and the activity of soil microorganisms. 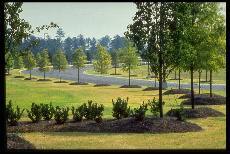 Determine the soil pH of your site and choose a tree species that grows well in that range. Light - Determine the number of hours of direct sun the planting site receives in summer, since different tree species require differing amounts of sunlight. Trees requiring full sun (like most large-maturing trees) need at least six hours of direct sun. Those suited to mostly shaded to partially sunny sites (like flowering dogwood) will adapt to three to six hours of direct sun. Space - Be aware of above-ground conflicts such as overhead wires, buildings, signs, other trees, etc. that would restrict unobstructed tree growth. Select trees that will have a mature size or form that will fit within the space available. Underground space is critical for sufficient root system development and tree health. Root systems can be very extensive, spreading a distance two times the height of the tree or more. Yet, most of the roots will be in the top eight to ten inches of the soil. Once your planting location has been chosen, and before you dig the tree hole, call your local utility locator company to avoid breaking lines while digging. This is a free service and they will indicate if there are any utilities near or at your planting site. Temperature (Hardiness Zone) - Trees can adapt to a wide range of environmental factors, but withstanding the lowest winter temperature for an area is critical. The continental US and Canada have been divided into 10 zones based on a 100F difference in average annual minimum temperature. Choose trees that are appropriate for your specific hardiness zone. Will the trees fulfill your intended landscape objectives with minimal care? Tree Size and Location - Will the space adequately accommodate the tree you would like to plant? Mature height, crown spread, trunk flare, and root space are all important factors to consider before planting. Know what the tree will look like as it nears maturity. Crown Form - The shape of tree crowns varies with different species and varieties of trees. Select trees with specific crown forms to accomplish certain landscape objectives or to fit the available above-ground space. Shade - Trees provide a greater cooling effect than man-made structures because not only are the sun rays blocked, but water is added to the air through transpiration. High, wide-crowned trees with deciduous leaves are the best providers of shade. 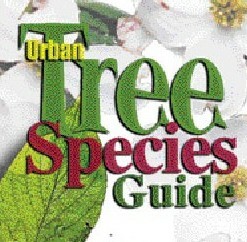 Maintenance and Health Issues - Some tree types are more "problem-free" than others. Determine if the tree being considered has messy fruit or particularly large leaves that must be cleaned up. Is branch structure such that it requires frequent pruning or leads to premature branch failure as is often the case with Bradford pear? Fast-growing trees like silver maple provide quick shade but typically have brittle wood that easily breaks in strong winds. Be aware of any insect or disease problems that will require frequent attention or lead to health problems and early tree death. Aesthetics - Trees add beauty to the community landscape. With planning trees can be used to enhance the appearance of structures and grounds. For example, to give a site an appearance of greater depth, plant on a diagonal line outward from the front corners of the building. This is called framing. Trees planted behind the building and to the side will provide background. Trees can also add visual appeal to parks, parking lots, streets or patios. Accents - A tree with color or some other showy feature can be used as an accent point in your landscaping picture. Don’t overdo accents. For visual accent, select a tree that contrasts with the characteristic landscape in one or more of the design elements - form, size, color, or texture. The more contrasts, the stronger will be the accent. Wildlife - Consider tree species with berries or nuts that are attractive to songbirds. Now that the right-tree-for-the-right-place has been chosen, it’s time to plant. Before digging,find the topmost root growing from the trunk of the tree. This is called the root flare area. Remove any soil above that point across the entire root ball. Measure from the topmost root to the base of the root ball to determine its height. Dig the planting hole roughly three times wider than the diameter of the root ball. Dig no deeper or slightly less deep than the height of the root ball. The hole should be bowl-shaped with the sides sloped. Save the soil. Place the tree in the hole so that the top of the ball (root flare) is even with the soil level or slightly higher. Don’t cultivate the bottom of the hole, it may cause the root ball to settle and the tree to be planted too deep. Remove any burlap, wire, twine or strapping. Back fill with the soil that was removed from the hole. Don’t amend the soil with compost, peat moss, other soil, or fertilizer.Tamp soil lightly but do not compact. Form a one-to-two-inch berm of soil around the edge of the planting hole to hold water. Fill the "saucer" with water once or twice. Mulch the root ball surface and planting area. Use three to four inches of organic material. Keep the mulch one or two inches away from the trunk. Keep the tree well watered for the first year. Water every day for 2 weeks and every other day for two months and then weekly until the tree is established. Remember - watering frequency depends on many factors: rainfall, temperature, and soil type. When watering, use two gallons of water per inch of trunk diameter. Do not over water or saturate the soil. Large Trees >50’ Suitable for areas with more than 200 square feet of total planting area; in a planting strip at least 7’ wide; or place at least 6’ from pavement or wall. Medium Trees 25’ - 50’ Suitable for spaces with 100 to 200 sf of total planting space; in a planting strip at least 4-7 feet wide; or place at least 4’ from pavement or wall. Small Trees < 25’ Useful under utility lines; areas with < 100 sf of total planting area; a planting strip with a width of at least 4’; or planted at least 2’ from pavement or wall. 10-15’w PS/FS H S E Brazil. Soil adaptable. Drought tolerant. Showy orange or yellow fruit attracts wildlife, significant litter. Southern range only. Zones 8B-11. For additional copies contact Clemson University’s Sandhill Research and Education Center, Columbia SC or the SC Forestry Commission. Funded though an Urban and Community Forestry grant from the SC Forestry Commission.